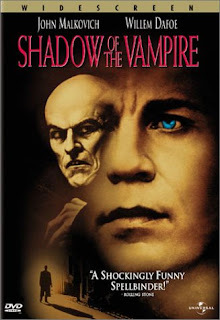 A hit on the indie circuit, “Shadow of a Vampire” is a fictional account of the 1922 “Nosferatu” production, with much borrowed from reality. Eccentric, egomaniacal genius F. W. Murnau (John Malkovich) is determined to realize his cinematic vision, despite lacking the full resources and support de rigueur for executing such grandiose visions. The director is confident of at least one asset: his lead actor. The obscure “performer” is currently living in a cave near the Czechoslovakian shooting location. The rest of the cast has a little trouble adjusting to Count Orlok (Willem Defoe doing a brilliant Max Schreck impersonation), who takes method acting to the extreme by living inside his repulsive makeup and creepy persona. After he starts eating raw bats and lurching towards jugulars with thirsty longing, his costars begin to worry that he might be exactly what he seems to be. As Murnau continues headlong with his legendary shoot, the tension builds towards the climactic scene (both for the film-within-the-film and the film-that-is-the-film). The over-the-top performances showcase the clash of egos and obsessive drives that lend directors mythic legacies and fill pages of gossip columns. Merhige underlines the self-destructive thrill of the director and the all-consuming identity-loss of acting all-the-while generating postmodern grins and generation-old shrieks. The inspired casting makes much of the magic possible; even Udo Kier has a role to ensure this film’s cult status. If “Les Vampires” shouldn’t count as a vampire movie, “Irma Vep” shouldn’t even be considered, but oh well. 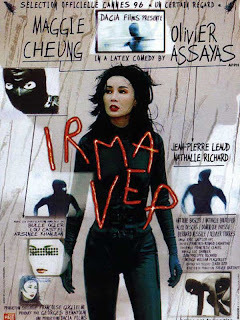 “Irma Vep” is a post-modern movie-within-a-movie about a French director who passionately wants to remake Feuillade’s seven hour silent “Les Vampires” with Hong Kong action star Maggie Cheung as the eponymous villain. Though the film is a satire aimed in many directions at once, it keeps a warm heart and personal focus. I found myself instantly won over by the director (played by Jean-Pierre Léaud) and his insane idea. Maggie Cheung is great as herself, providing some cross-cultural conflict, an inexplicable determination and a surprising affinity for the role. Assayas’s troubled shoot allows him a chance to riff on the film industry, cineaste culture, the art world, celebrity worship and relationships (including the perennial vampire theme of lesbianism now channeled through an informed modern realism) with equal parts humor, humanity and insight. The skin-tight cat-woman suit that Mrs. Cheung must wear for the part becomes the object of multiple fetishes and a way of unlocking inner spaces long repressed (and not just sexual). The power of the role soon consumes the actress in unusual ways. Despite the dogme-95 mod-grittiness, the film comes off hip and breezy. It culminates in an unexpected triumph in the midst of a seeming implosion and, for those with the spark of whimsical avant-garde rebellion, provides one of cinemas most magical final sequences. With the release of “30 Days of Night” in theaters now (October 2007), it’s hard for me not to notice that Sweden’s Anders Banke beat it to the punch (though his film will probably be seen by 1/100th as many people). The premise of both films is a horror story in the polar north where midwinter nighttime lasts for months at a time; the perfect breeding ground for a vampire horde. In present-day Sweden a girl named Saga is moving into a night-drenched town with Annika, her single mother. Annika is a doctor at a near-empty hospital where Beckert (you’ll have heard this name in the WWII prologue) is running some private genetic experiments. His patient wakes up from a year long coma and takes a bite out of Annika, his drugs get stolen for a wild high school party and just about everything that can go wrong does. Banke’s brilliant premise and clever title were enough to get the DVD into my player, but the exhilarating opening scenes sealed the deal. It isn’t evident from the start, but the director has a crazy, offbeat humor that really works, perhaps because it never completely overtakes the action or horror. The post-modern wit and amazing spontaneity (a la “Scream”) is a welcome solution to the usual teen-horror traps and manages to avoid, subvert or cheerfully mask the expected genre clichés. I’m sure it’s already been said by others, but “Frostbitten” does for vampires what “Shaun of the Dead” did for zombies. I mean, how can you not enjoy a teenage vampire falling (and being impaled) on a wooden garden gnome and lamenting that it’s the “uncoolest” way to die? Despite the nods, winks and smiles, Banke has a morbid streak and brash fatalism. Rarely does a teen horror movie get so overwhelming and hopeless. This is not a movie where the vampire is just a surrogate serial killer with a few super powers. Instead, they are a cross between an army and an epidemic, a force that is violent, powerful and nearly irresistible. “Frostbitten” sets a stake against your heart and keeps pounding it till the show is over. 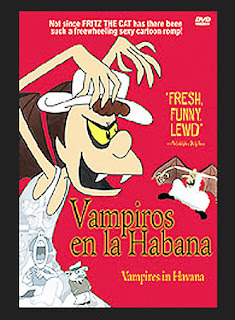 Cult Cuban animation director Juan Padron made one of his most successful outings with “Vampires in Havana” (1985). The free-wheeling, chaotic adventure dashes through a crowd filled with popular genres, exotic ideas and surprising subtext with an energy and exuberance matched by the films many chase scenes and action pieces. Our hero, Joseph Amadeus Dracula is an anti-government, trumpet-playing ladies man with the charisma of an imperturbable rascal and the determination of an idealistic political posterchild. The prologue introduces us to Joseph’s uncle, a top scientist working on a potion to cure vampires of light sensitivity. His early high-profile failures force him into exile but he continues to test new formulas on his unwitting nephew. Joseph grows up without ever knowing his true nature and spends most of his time playing subversive trumpet anthems and reassuring his rebel-compatriot girlfriend that he harbors no love for the VIP mistresses he “interrogates” undercover (and under covers). The truth is revealed in short order to the American and European vampire gangs and to the skeptical Joseph. Far from making the family rich and happy, the announcement triggers an elaborate series of assassinations and espionage. The American side tries to eradicate the formula to preserve their empire of simulated tropical nightclubs (which would flounder if vampires could visit real beaches), while the European consortium tries to steal the brew and market it as a wonderdrug. The result is a clever, hilarious and often bawdy adventure with multiple threads diverging and merging over the course of a couple madcap days. Juan Padron is as good at providing an entertaining time for audiences as he is as at flinging stinging barbs at national and international socio-political targets. The script is full of puns and playful twists and is informed as much by period Cuban culture as it is by the more esoteric points of vampire mythology. Skilled vampire assassins show up that can transform into dogs or spheres of pure energy (that can pass through matter! ), and all these unusual superhuman powers get foiled in amusing and creative ways. The animation itself suffices for the story but clearly suffers from the budget restrictions and hesitant commitment to style. The film has the definite 70/80’s look of “Schoolhouse Rock” and a touch of caricature that’s too broad for the idiosyncratic premise. While not a terribly satisfying visual presentation, the film nevertheless has a pleasant feel and retro cuteness lost by slicker high-budget animations. The lightning pace and inspired story keep the faded look from seriously marring the experience. 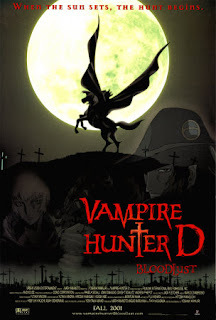 “Vampire Hunter D: Bloodlust” (2000) is a sequel to the 1985 original, both of which are based on Hideyuki Kikuchi’s long-running series of popular novels. The films take place in a strange, visionary universe more than 10,000 years in the future. Humanity consists of disorganized and squalid hamlets regressed to medieval conditions despite the decaying remnants of technological glory. The significant presence of mutant creatures and supernaturally gifted humans implies a past speckled with nuclear conflict although only the relatively-recent war against the vampire “Nobility” is explicitly treated. The Nobility has long been in decadent decline and has the few surviving grandmasters are hunted by powerful killers like D and the Marcus brothers. D and the brothers are both hired by a wealthy human whose daughter, Charlotte, has been kidnapped by the vampire Count Meier Link. Link has hired protection in the form of several demonic creatures, including a shape-shifter, a shadow-creature and a werewolf-variation. An episodic series of battles, ambushes and showdowns paves the road to a haunted castle, where plot complications, a maniacal vampire spirit and a rocket ship await. Yoshiaki Kawajiri directs what may be the most creative vampire tale ever filmed, an epic that could never have been visualized without the fanciful excesses of anime. The dark post-gothicalyptic artwork is raging with atmosphere. Not one for subtlety (see “Ninja Scroll” ), Kawajiri overwhelms our senses with imaginative sequences and sheer quantity, be it armies of mutant zombies, showers of arrows or rooftop seas of twisted crucifixes and castle spires. Every location has a memorable ambience. Each duel between D and a mutant legion of Link has a clever twist. Each character might not possess a very real, original or developed personality, but all of them at least have a unique and rousing ability for dispensing violence. Kawajiri’s anime comes together quite well, with the art and story traveling hand in hand. Those who have not read the books (like myself) will find some of the motives obscure and a few of the events rather arbitrary, but the action, imagination and illusion of depth easily sustain the film. The 13 episode anime series “Hellsing” (2001) made similar attempts at outrageous vampire mayhem, but sorely lacked the creativity, variety and class that “D” possesses. John Carpenter also tried his hand at developing a team of vampire hunters not far off from the Marcus brothers, but his “Vampires” (1998) is a total mess. I'll save you the trouble: the Vampire Hunter D novels (or at least the original that I read) aren't very well-written. But I am both stoked and flattered that Vampire Hunter D: Bloodlust got so high on the list! I don't think I was planning to read them anyway, considering that there are like 18. The movie however, manages to translate the ambitious scope into something quite palatable and compact. It was very close to being #5. However, being high on a vampire list is dubiously impressive, since the ratio of crap to genius is pretty high. Thanks for screening D for me, by the way. That was a good time. Absolutely loved Irma Vep. The final turn was so unexpected, and so damned sobering.